Doyle Lee Hamm was convicted of robbery-murder in Cullman County, Alabama, on September 25, 1987, and sentenced to death on Monday, September 28, 1987. His capital case grew out of the tragic death of Patrick Cunningham. On the night of January 24, 1987, Mr. Cunningham was working as the night clerk at the Anderson Motel and was fatally shot during the course of a robbery. Two individuals were initially found in the car used to commit the crime: Regina Roden and Douglas Roden. The Rodens claimed that they had been kidnapped by Mr. Hamm and held in captivity at gunpoint. After time in detention in the county jail, Regina and Douglas Roden changed their story and told the police that they were the unwitting accomplices to Doyle Hamm, who was the trigger-man in a robbery in which they participated. 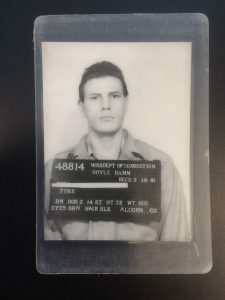 At the guilt-phase of the trial, the state presented the accomplice testimony of Regina and Douglas Roden, who both testified in exchange for lenience, and a statement obtained from Doyle Hamm after lengthy interrogation. As the federal district court noted, “both of the Rodens entered into an agreement with the state whereby they would testify against appellant at trial, which they did, in exchange for being allowed to plead guilty to lesser offenses.” Apart from that, there was no direct, independent evidence, nor any physical evidence, as to who pulled the trigger. The jury penalty phase trial began on September 28, 1987 at 11:15 a.m. Mr. Hamm’s attorney made a two-page opening statement. Mr. Hamm’s attorneys called only two witnesses, whose testimony took less than 19 minutes. That same afternoon, after closing arguments and jury instructions, the jury returned a death verdict by 4:30 P.M. by a vote of 11 to 1. The circuit court sentenced Mr. Hamm to death. In state habeas corpus, post-conviction counsel discovered a wealth of mitigating evidence that was admitted at the Rule 32 hearing. Subsequent to the hearing, on Friday, December 3, 1999, the Alabama Attorney General filed an 89-page “PROPOSED MEMORANDUM OPINION” with the circuit court, essentially the draft of a judicial opinion. The very next business day, on Monday, December 6, 1999, the circuit court signed the “PROPOSED MEMORANDUM OPINION” without so much as removing the word “proposed” or making a single alteration to the document. Since that time, every state and federal court that has reviewed Mr. Hamm’s arguments have deferred to that proposed opinion written by the state of Alabama.